One of the most delicious mollusks or (molluscs) from the sea. They are so robust in flavour and texture that they can carry off virtually any other flavour you cook with them. From a curried creamy sauce to a plain broth of salt water. One of the most versatile ingredients from the sea in my opinion. Of course there are fresh water mussels as well, of course these are much rarer and nearly became extinct. The good news their population is back on the rise due to collaboration in the Lake District. Below the recipe is a complete guide to cook, cleaning and storing the mussels. In fact everything you will need to know about mussels. They grow in the wild seas and oceans around the world. You can usually find mussels on any coastline clinging to rock formations. They only difficulty of harvesting your own mussels from the shore is the access to them. The ones close to the shore line have usually been picked and the ones that are left are to small to eat. The big ones are in rocky bays which are near impossible to get to. There are large mussel beds that either get dredged or raked on a commercial scale, of course you cannot just go and pick these. The other down side is the wild mussels of the seas also have a lot of growth on the shells (barnacles) and can be very difficult to clean before cooking. However if you do manage to grab yourself a good couple of handfuls of these mussels you won’t be disappointed. They taste absolutely amazing especially if your luck enough to be able to cook them on the beach on an open fire. Most of the mussels we eat are cultivated mussels. Where are the best cultivated mussels grown in the UK. Well the Scottish will of course say Scotland is the best place for mussels. 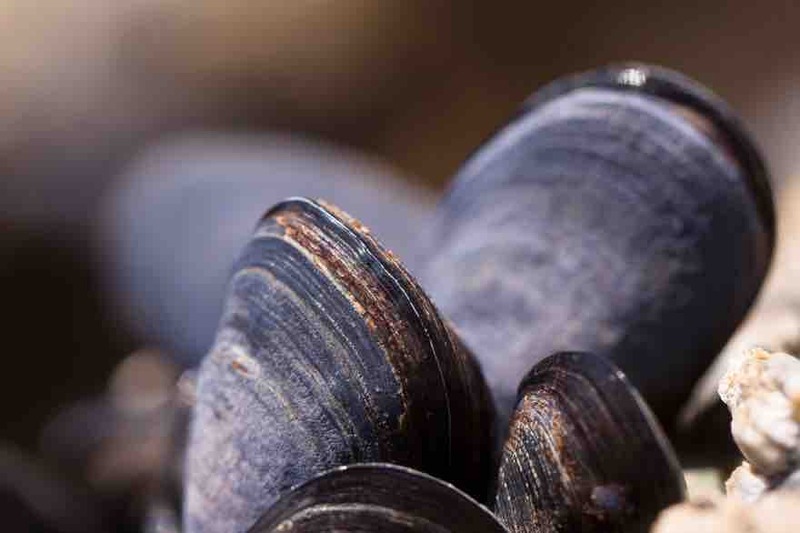 The English will say the best mussels in the UK come from Cornwall. I will let you judge for yourselves where the best come from but we are lucky to have two places in the UK that produce world class mussels. Of course there are many other place around the UK that produce fantastic mussels. 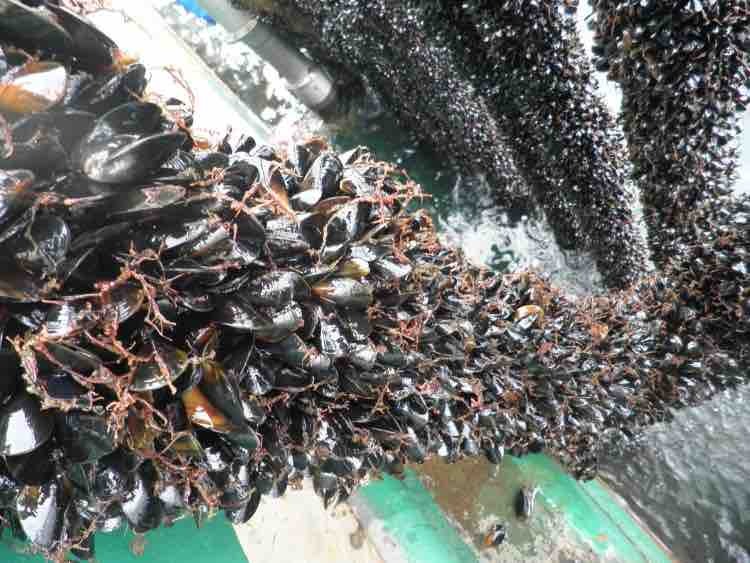 The cultivated mussels are grown on ropes or on the rocky sea beds. The mollusks take around 18 to 24 months to grow to a size where they are worth harvesting. 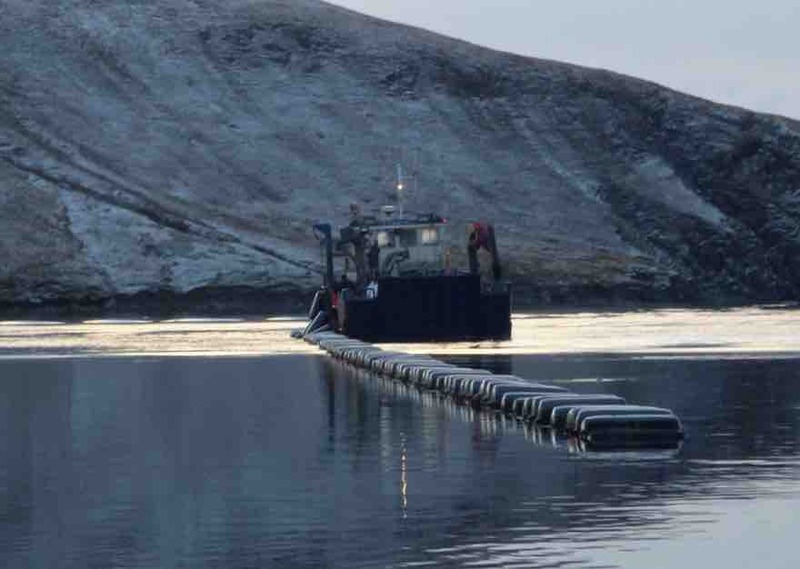 This also ensures that there is also a level of sustainability of the beautiful meaty sea treats.The Shetlands are the most prolific growers of mussels in Scotland. There ropes are often hanging from rafts in secluded protected bays. Perfect growing conditions for plump juicy mussels. It is unbelievable that we export most of our mussels to the rest of Europe. To me its a mystery as my parents always ate mussels, ok as a young child I didn’t really like them. Well I say I dint like them what I actually meant is that I did not like the look of them. I had never actually tasted them. However on a regular basis there would be a big string bag of mussels in the house. It was always my dad who would be over the sink washing and cleaning the mussels. I presume the reason why we eat so little in the UK is tradition. There has never ever been a big tradition of eating our very own seafood. We just do not have the knowledge passed down on how to prepare and cook these delights. My parents never had anything particularly exotic when they prepared their mussel recipe. It was just a simple copy of belgian moules mariniere. Now I have wrote this down the tradition came from my mums cousin who married a Belgium national. Mussels and chips on every corner in Belgium. We do not cook them because we do not know how to. The only thing I can remember was when I sat and watched my dad clean the mussels was the advice he gave whilst scrubbing and de-bearding them. Of course I was lucky enough to clean them myself even though I dint eat them at that age. Dads are just to crafty (He has long gone but I typed that with a smile and a tear at the memory). As I wipe away the tears and close my eyes to remember his words of advice on mussels. When the mussels are cooked (5 mins) any shells that are not open, throw them away. I have stuck by those simple rules for preparing and cooking mussels for a lifetime and I have always had delicious results. Mussels taste of the sea, slightly salty not unlike other shellfish such as prawns, cockles or clams. The texture should be soft and velvety and then a firm texture towards the centre. If they are chewy or rubber then they have been overcooked, the same as squid (calamari) when over cooked. My advice if you are tasting them for the first time is just eat. Don’t analyse it just taste. The flavours and texture is unlike anything else. Once you have tried mussels you will want to try them again and again using a multitude of flavours. Fresh Mussels from the sea take only around 5 (five) minutes to cook. Its the cooking of the other ingredients that you flavour the mussels with that takes the time to cook. However you can prepare a mussel dish in around 10 minutes. Mussels are one of the fastest foods around. Like any food from the sea. 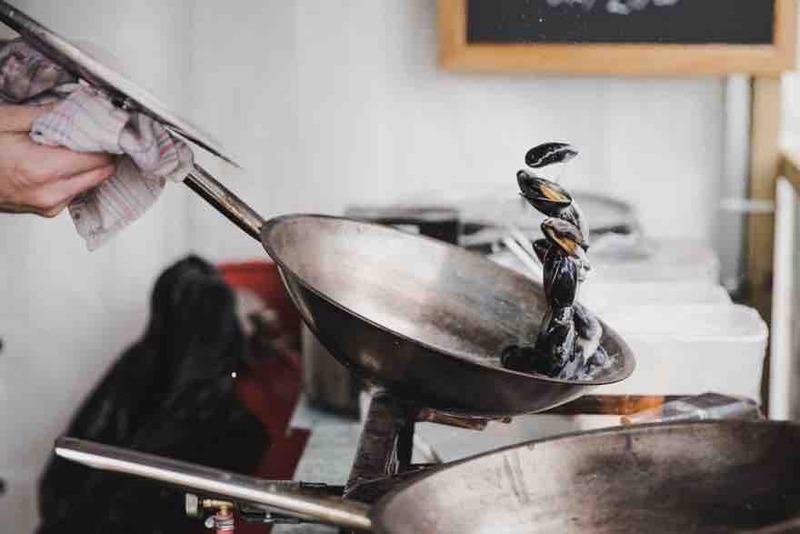 There are a multitude of ways to cook mussels, probably more than you could ever think possible. I usually cook them in the broth/liquor/ sauce that I cook the other ingredients in. This method of cooking the mussels is the easiest and the most reliable if you are a beginner at cooking mussels. Its so easy to take the pan lid off the cooking pot to see if the mussels are open and cooked. Even easier if you have a glass lid to your pan. 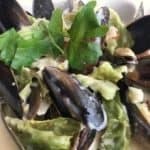 Of course everyone has heard of the classic moules mariniere recipe but not everyone has eaten them. Some people prefer not because of the wine and cream in the recipe. Yes you can cook mussels without using wine. The simplest one would be to cook in a tomato broth with thyme and garlic. You can simply cook them in plain salted boiling water. Or you could go Belgian and cook the mussels in beer, cider or a hoppy larger. Alternatively Asian style in a coconut broth with chillies and lemon grass, delicious. What about Indian and cooke them in a korma curry sauce. They are also delicious cooked in a bold red wine with tomatoes garlic and herbs. There are several ways of eating mussels as politely as possible when they come served in their shells. I personally take my first mussel and split the shell in half and then hold the thinest part of the shell. I then use it as a scoop to take the mussel meat out of the other half of the shell. You could use a small teaspoon to scrape out the meat. When we visited France last year to stay at cousin’s Gite’ we had mussels a few times. Of course we had the classic moules mariniere with fries. There must have been at least 2lb of fries with the mussels. I digress most of the French people took the mussel meat out of the first shell and then used the complete shell as pinchers to grip and pull out the mussels from the other shells. When all the mussels have been eaten and the shells discarded onto a clean plate they then throw hand fulls of chips into the broth and then eat them. 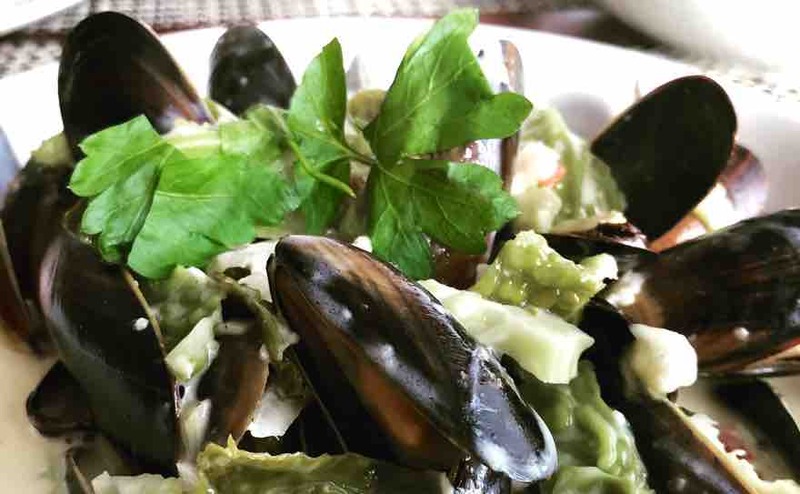 No need to be scared when cleaning your mussels as it is a really simple task. Place a colander in the sink and empty your mussels into it . Turn the cold water on and the first job is to simple scrub them clean with a good stiff brush under the running water. The next step is to remove the beard from the mussel. Hold the mussel in one hand with beard pointing up, then with a knife grab the beard between the knife and your thumb. The just quickly pull towards you and then the beard will come out. Remember to follow the golden rules of preparing the mussels. Throw any away that are not suitable. The best time to buy mussels is when there are in season. I have always been told that they are only available when there is an R in the month. So technically the mussels are available from September until the end of April. You can buy mussels throughout the year now. They come frozen which are great for adding to seafood stir fry dishes and even paella. They also come vac packed and often have a sauce broth include to keep them moist and tasty. This is what I have used in my recipe. It is perfect for the first time cooks as the mussels have already been cleaned and you only need to check for broken ones. I have heard that you can buy them tinned, I have never dared trying them or even looking for them . I am sure that tined mussels may have there uses somewhere. No mussels are not expensive at all especially when you buy them in season. Of course the fresh ones that you have to clean yourself are cheaper. Simply because you have to do all the preparation yourself. They become even cheaper when you bulk out the recipe as I have done. Personally I find it satisfying cleaning them the best I can before cooking them. Those shiny blueish grey mollusks shine out from the broth, as I know it will be heaven on a plate. There are some expensive mussels on the market and usually the bigger the individual mussel is the more expensive they become. This is only natural as the growing time is a lot longer and the farmers have to wait longer before harvesting their crops (mussels). 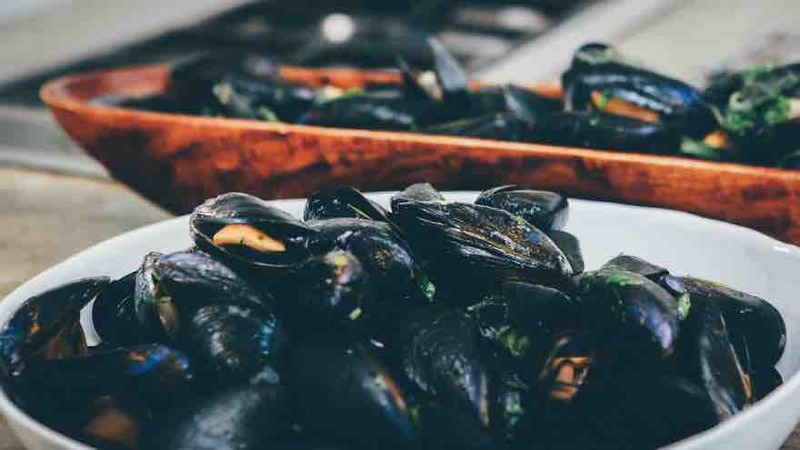 Probably the most expensive mussels are the green lipped mussels from New Zealand, these can be supersize because of the time they are left to grown and the conditions. Its not very often or for very long I store mussels at home. The only reason being is I see them I the supermarket and cook them the same day. However if you wanted to store them at home the ideal place is the fridge. Empty the mussels from their string bag in a bowl of water. At this point you can check for any broken ones and discard them immediately. 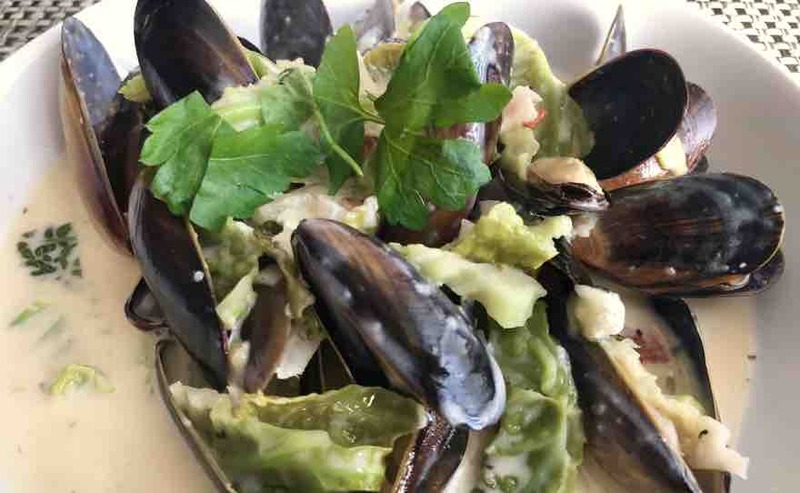 Now if you can sauté’ an onion then you can cook this classic moules mariniere recipe. Every celebrity chef has their own version of moules mariniere but basically they are the same. All you need is Onion, garlic, white wine , parsley and cream to go with the mussels. Some people vary the herbs used such as thyme or a bay leaf in this classic French dish. The cooking method is simple to. Dice your onion, fry in a little oil and butter with the garlic. Cook until the onion is translucent. Now add your mussels, a glass of white wine and 200ml of cream. Then put the lid on the frying pan and allow to cook rapidly for around 4 minutes until the shells have opened. At this stage you can serve them straight away with some chopped parsley on to. Or you could remove the mussels into some warm serving bowls and put the pan back onto the heat. This will reduce the cream and wine sauce and thicken it a little. This makes the sauce coat the mussels more and intensifies the flavour some more. You could also add a teaspoon of French mustard to the sauce. 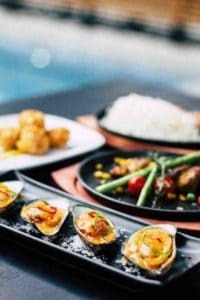 This is a simple guide for you to be able to create virtually any cuisines flavour to go with your mussel recipes. Just follow the basic steps below and you will easily be able to create a world of flavours with the mussels as the centre piece of the dish. This is after you have cleaned the mussels and discarded any that do not meet the criteria. The oil could be vegetable oil, olive oil, butter and oil, rapes-seed oil, sunflower oil or ghee, any oil you want to use. cook the aromatics with the onion so they release the flavour into the pan and the onions. Of course do not all the flavours I have mentioned above. Just use two or three of your favourites that go well together. Now add you bulk out ingredients if you want the mussels to go a little further. Savoy Cabbage, chickpeas, leeks, par cooked potatoes, sweetcorn, peas, pak choi, small pasta (orzo), par cooked rice, spinach peppers. Let these staples cook through for a few minutes to absorb the flavours and warm through before the next stage. Just add your favourites and not all of them. 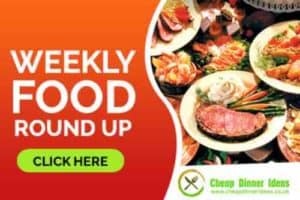 Salted water, vegetable stock, white wine, red wine, cider, beer, larger, coconut milk, double cream, chopped tinned tomatoes. The liquid quantities is up to you, do you just ant a little bit of sauce/broth with your mussels or do you want them smothered. You only need about 1 cm of liquid in the pan for the mussels to cook as once the pan lid is on the mussels steam in the heat. Place the pan lid on and let them steam/cook for around 3 to 4 minutes until the shells are open. 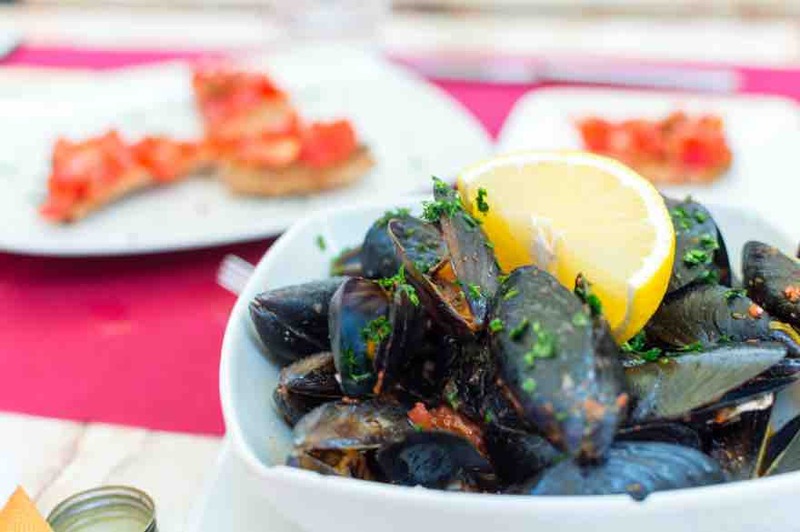 Just follow these 5 simple rules to cooking perfect mussels every time. Just because the mussels come from the supermarket shelf already added wit flavour it doesn’t mean thats it. As with my recipe below I added more flavour, of course it has to be complimentary. The ones I bought from Morrison had garlic in so adding more garlic isn’t a problem. Follow the 5 steps from the base guide of cooking and add complimentary flavours. If cooking the mussels from frozen than add al least 5 minutes extra cooking time. Frozen mussels can be used exactly in the same way as fresh sea mussels in recipes. Always follow the instructions on the packet, thaw if required.Mussels that are frozen are great for stir fry’s paella fish pies. You just need to be careful that you do not over cook them as they are usually cooked then frozen. I made this mussel dish for me and my mother and to keep the cost down I used a pre-packed mussels for 1 from Morrison which cost £2. As we were sharing the pack I needed to add some more ingredients to the mussels to ensure it was filling and tasty. So the fridge was raided looking for some delicious ingredients. Something to add to these tasty mollusks dish. In the classic moules marinier they serve fries, however just as good are wedges, cheap and great for mopping up the cream sauce. Any of these wedges recipes would be good with this mussel dish. You could also try eating them with some delicious sweet potato wedges. They are also great served with some crusty homemade bread. Simply prepare the mussels as per the golden rules the follow the base cooking method one. Now follow stage two of cooking and add your garlic at this point. Do not at the butter as it may burn. The jump to stage five and add your mussels and cover. Once the mussels have opened you can now add your butter and a little more fresher chopped garlic to enhance the flavour in your garlic butter mussels. Simply serve your garlic butter mussels with bread. These are fantastic tips! My husband would love for me to make these for him! So many great tips. Testing it with an onion, who would’ve thought? Looks like I need to start cooking with musells more often. I know now everything there is about mussels, thank you. I love, love mussels so now I am off to the store to buy a pound, just for me. Great recipes. I’ve never had mussels they are for sure on my food bucketlist! !